The TTC Community Liaison Group (CLG) met the evening of 10 December. These meetings are used to report actions taken on items noted at the previous month’s meeting, report construction updates, and to identify problems/issues since the last meeting. Community delegates, Community Liaison employees, City of Toronto staff, Chief Project and site engineers, and [General contractor] Pomerleau staff were present. Twelve action items from the past meeting were addressed or partly addressed and carried forward for further action. Of significance to cyclists: Response to Action Item #9: The new timeline for the Phase A full closure (north side Lake Shore to plaza driveways) has been revised to be in effect from January 6 to end of February 2014 – weather permitting. 5) Leslie Street north of the plazas to Eastern will be closed from March to May 2014. 4) Some signage indicating access to the Martin-Goodman Trail is now blocked by hoarding. All new sign locations are to be confirmed on site walk, Dec 18. In addition, several cycling-related issues were identified during the month. Telephone calls and emails were sent to the Community Office. 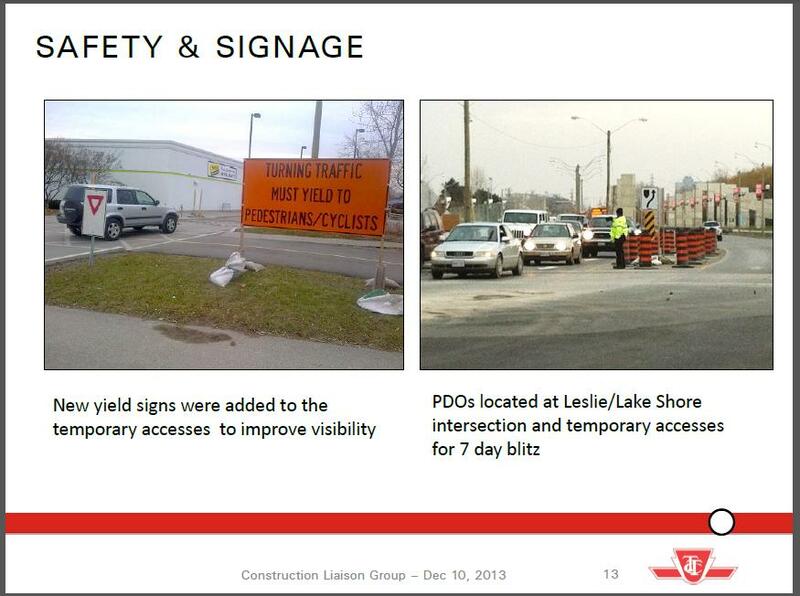 If anyone sees a safety problem when you are in the construction zone, you can report it to Liz or Niki at 416-981-7362 or email niki.angelis@ttc.ca. Next Post Visioning a Cycle Track on the Dundas / Carlaw Corridor using "StreetMix"